Host a showing of this wonderful film - we have everything you need to do that. Could even be in your own home with friends and neighbors! Mount Horeb Past Event Info Below. 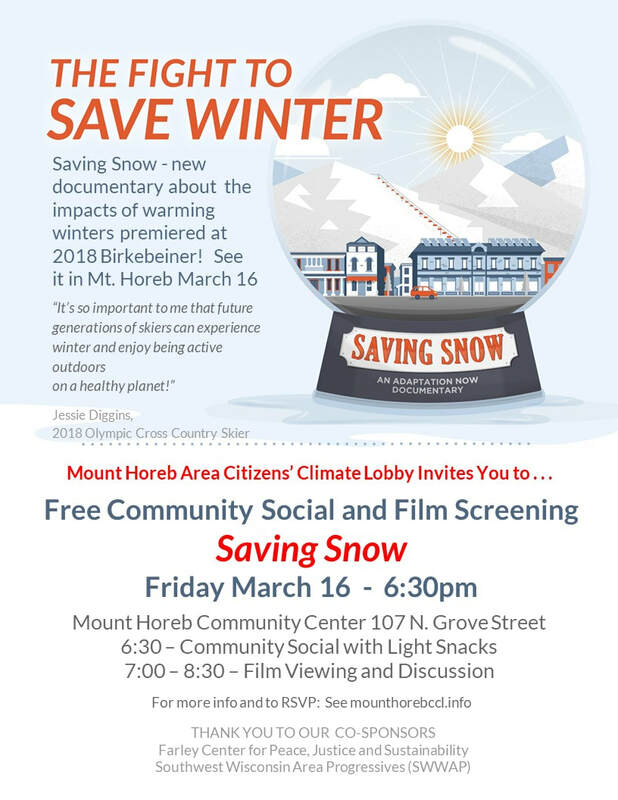 Following its premiere at the American Birkebeiner ski race, where filming of the documentary began, Saving Snow was released with a wave of community screenings across the country. And yes, Mount Horeb was part of that wave! ​This screening was co-sponsored by The Farley Center for Peace, Justice and Sustainability and Southwest Wisconsin Area Progressives (SWWAP). Saving Snow focuses on people coming to terms with these changes. But it also presents solutions. The film highlights individuals and organizations who are working to reduce their communities’ impacts on the environment and raise awareness of the need for action. With the Olympics happening this winter, athletes are also speaking up about what they see happening to their sport. Jessie Diggins, USA Olympic Ski Team says in an interview with the New York Times: “You can look at different solutions for the economy, but you only get one earth to live on, and you have to breathe the air that is on this earth. We have to do it in a way that doesn’t hurt families economically, which is why I’m supporting the carbon fee and dividend solution, because it puts a fee on carbon and returns the revenue to households.